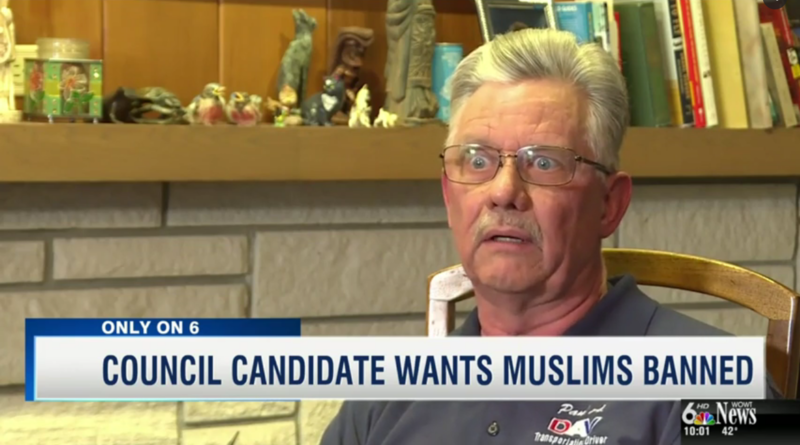 One of Nebraska’s city council candidates wants Muslims and the practice of Islam completely banned from the U.S. He calls it his own Muslim ban, inspired by Donald Trump. His version however, has nothing to do with travel. In an interview with WOWT, an NBC-affiliated television station located in Omaha, Nebraska, the candidate, Paul Anderson accused local Muslims of having ties with the Muslim Brotherhood, calling the group a terrorist group. Anderson believes they are linked to Omaha masjids. How does Anderson know? Here’s the interview transcript from WOWT News. “I got this evidence from a very reliable source,” he told reporter Don Granese. “Do you have copies of the evidence?” asked the reporter. Anderson also wants to stop the construction of a new masjid. “There will be no mosque in Omaha,” he told WOWT. The masjid, being built on the Tri Faith Initiative campus in Omaha, will actually be one of four mosques in the area. “He doesn’t know his city too well.” said Rana Jafar, a board member at the Islamic Center of Omaha. Jafar has also invited Anderson to the masjid, to show what the inside of one looks like and ask him a couple questions. On Friday, Anderson was met with backlash over his statement and ads calling for no masjids in the city from his two opponents, Pete Festersen and Grant Sturek, as well as from many on social media. All three men are on the ballot for the April 4 primary. Two will then advance to general election. He also learned of the presence of the other three masjid, regrets his words and wishes they were better resourced. He also suddenly now cares for Muslim people. The kicker? This is Anderson’s tenth time running. Sorry hunty, looks like only Donald Trump can be unqualified, bash Muslims and win.